2015 marked the centenary of the death of possibly the most famous cricketer of them all, W.G.Grace. Known usually by his initials and Doctor or Doc due to his medical expertise, Gilbert suggests that it was his middle name by which his close family knew him. Many books have appeared this year to celebrate this larger-than-life figure but I must admit to wondering what Gilbert might be able to add. Reviewers had been very complimentary of Gilbert The Last Years of W.G.Grace and I had enjoyed Charlie Connelly’s Elk Stopped Play and other books for their, at times, bizarreness and undoubted sense of humour. I did, though, wonder how Gilbert would pan out having read about Charlie’s take on his latest subject. As it happened, there was absolutely nothing to fear and, in a completely different way, I have learned a vast amount about the Downend Doctor and biggest cricket celebrity of the early days. Written through the eyes of how the Doctor might have seen his last seventeen years, Gilbert offers an enlightening view which may surprise readers and students of the game who may have read about his dominant personality. Haven’t we all read about, as one cricketer described him, the artful old toad’s hold over umpires and some of the ruses to keep his wicket intact? We can easily find about his background and family but Gilbert tells us about, in his latter years, the distress at two of his children’s early passing, his walking away from Gloucestershire after an impertinent letter from the committee, the loss of cricketers who took their own lives and his distress and fear when The Great War broke out. The 1914 season was closed soon after a letter of Grace’s was published in a national paper. Much of Charlie Connelly’s descriptive powers of these tragic times is superlative. Gilbert shows that the great man, The Grand Old Man, did have doubts and how much cricket still meant to him. Playing First-Class cricket well into his fifties and even club cricket until a year before his death, it is suggested that his wife knew that he was at his happiest with a cricket bag in his hand. Because Gilbert is written in how W.G may well have seen his last seventeen years, it is a very different type of style and a fantastic book for it. Readers of Gilbert may feel that they know Grace better for having read this book. It starts with the Gentleman and Players match of 1898 which Grace captained in celebration of his 50th birthday and ends with his last innings, an unbeaten 69, for his club side. 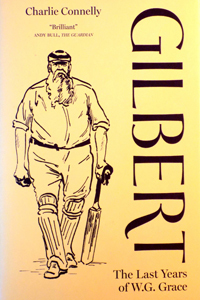 I wholeheartedly agree with other reviewers that Gilbert is one of the best, certainly most fascinating books on W.G.Grace that has recently been published. Congratulations and thanks to Charlie Connelly for bringing us a very different type of a book. Another wonderful little yellow book and another triumph for the author and Bloomsbury.